[Episcopal News Service] Episcopalians in and around the Standing Rock Sioux Nation Reservation are seeing their ministry change as the camps formed by water protectors along the Missouri River protesting the Dakota Access Pipeline are slowly closing. The temperature in the area may have climbed to 40 degrees on Jan. 30 but it is still the bleak midwinter in North Dakota and March can be the state’s snowiest month, according to the National Weather Service. 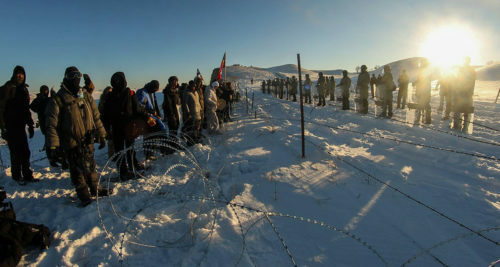 Tribal officials have said that the harshness of the winter is making the camps unsafe and they are worried about the protectors’ safety when spring melts the snow and the Missouri runs high. The effort to close the camps began before Jan. 24 when Donald Trump called for the rapid approval of the pipeline’s final phase. The Cannon Ball tribal district Jan. 19 asked the protectors to leave and the entire tribal council supported that move the next day. However, tribal leaders also point to the president’s efforts in urging their supporters to redirect their advocacy. The bridge referred to in the statement is the closed Backwater Bridge on North Dakota Highway 1806. It has been both a focus of protests and a symbol of the disruption caused by the monthlong encampments. The remaining work on the pipeline would push the pipeline under Lake Oahe on the Missouri River just north of the Standing Rock Reservation. The pipeline company has set up a drill pad very near the proposed crossing point, which is upstream from the tribe’s reservation boundaries, and the tribe has water, treaty fishing and hunting rights in the lake. The 1,172-mile, 30-inch diameter pipeline is poised to carry up to 470,000 barrels of oil a day from the Bakken oil field in northwestern North Dakota – through South Dakota and Iowa – to Illinois where it will be shipped to refineries. The pipeline was to pass within one-half mile of the Standing Rock Reservation and Sioux tribal leaders repeatedly expressed concerns over the potential for an oil spill that would damage the reservation’s water supply, and the threat the pipeline posed to sacred sites and treaty rights. The company developing the pipeline, Texas-based Energy Transfer Partners, says it will be safe. “The tribe is not expelling people,” the Rev. John Floberg, priest-in-charge of Episcopal Church congregations on the North Dakota side of Standing Rock, agreed. However, he said in a Jan. 30 interview with Episcopal News Service, the tribe is telling people that the winter has been so harsh that remaining in the camps can be fatal in a land where wind chills have reached as low as -60 degrees. The tribe also wants debris in the camp removed. People took good care of the camps, Floberg said, but a Dec. 5 blizzard inundated the area, collapsing and burying tents and other flimsy structures – debris that the tribe wants to ensure that spring floods do not sweep into the river. Many residents say they are tired of the Backwater Bridge being closed because it is their primary route to work and hospital services. The Cannon Ball community gym, used for sports, meetings and funerals, is in need of cleaning and repairs due to serving as an emergency shelter for protesters, some of whom continue to stay there, according to Floberg and the Bismarck Tribune newspaper. There has been some division in the loosely led Oceti Sakowin camp about whether to stay or leave, Floberg said, adding that from what he can tell the majority agrees with the tribe and is working to shut down the camp. Some campers have moved off the bottomland near the river to the top of so-called Facebook Hill. Some water protectors in the Rosebud Camp asked Floberg for his help in shutting down their camp but the Sacred Stone Camp, which is on privately owned land, is still welcoming people, he said. While the tribe had originally set a Jan. 30 deadline, it now seems that protectors have until Feb. 19. Floberg said he understands that as of that day tribal leaders will no longer use its “political weight” to stand as a buffer between a camp on the north side of the Cannonball River and the U.S. Army Corps of Engineers, other federal officials and the state of North Dakota. Floberg and local Episcopalians have been practicing a ministry of presence in the camps and in their local churches since the summer. They have funneled some donations to the Sioux Tribe to help cover the costs of dumpsters and portable toilets. 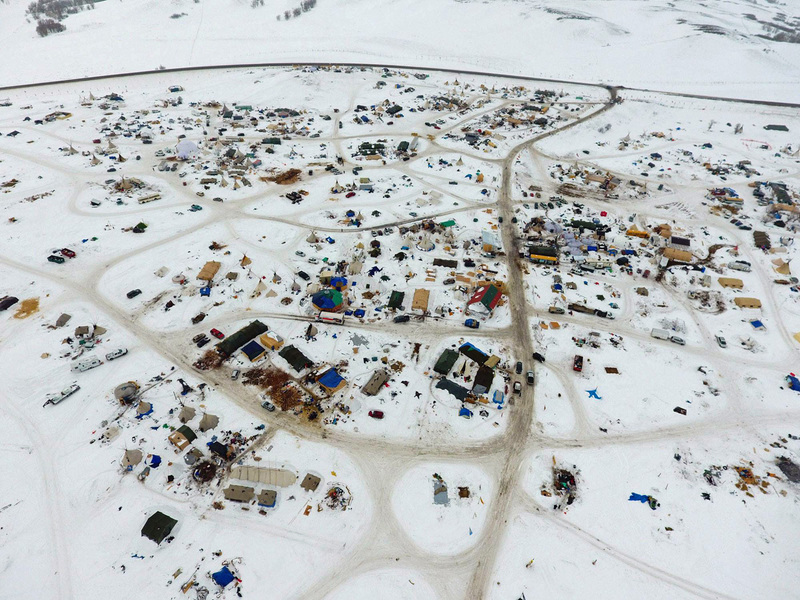 An Episcopal area at Oceti Sakowin has been a gathering point for those efforts. Episcopal chaplains were there when the Dec. 5 storm hit. These days, the ministry is changing. Floberg and some members of St. James Episcopal Church in Cannon Ball, the closest town to the camps, recently discovered a military-style tent in Oceti Sakowin filled with what he estimated is 100,000 pounds of food. It is mostly flour, beans and macaroni, which Floberg said can be salvaged. However, they also found canned vegetables that most likely have frozen and may not be usable. The food cache grew over the months as people coming to the camps brought food donations, Floberg said. The salvageable food is being donated to people living on Standing Rock and on the nearby Cheyenne River Sioux Reservation. “Our glamorous work of being protestors is now about moving flour bags,” Floberg said with a chuckle. Episcopalians could see what sort of work was going to be needed at the camps and positioned themselves to do that work, he said. That planning included using some of the money donated to the Diocese of North Dakota to buy a skip steer loader, a small, engine-powered machine with lift arms that a person can drive and use to move heavy loads and perform other tasks. Donations also covered the cost of a large covered trailer for hauling the food away and storing it. Local Episcopalians are grateful for those donations and “we’re still making use of them in the best ways that we know at any given a time and will continue to do that,” Floberg said. The changes in their ministry has been guided by listening to what the tribal council is saying and what Chairman Dave Archambault II is saying, and then trying to figure out how Episcopalians can assist. “It’s when the tribe is engaged outside of itself that we step in to stand with Standing Rock and make clear our position of support for what they have decided to do,” he said. Floberg and others are staunch in their desire to support the tribe’s decisions. However, Floberg said, it is difficult to serve all of the community when some members are frustrated with the camps, others are frustrated with tribal decisions and others are frustrated by those who are frustrated. For instance, can people in the camps still come to St. James in Cannon Ball to fill their water cans if the church supports the tribe’s decision that the camps should close? “Is that supporting the camp to remain open when the tribe has asked it to close or is it simply responding to basic human need? After all, we’ve heard it: Water is life,” Floberg explained. When that Feb. 19 deadline comes around Floberg and others “will have to listen again” to what tribal leaders are saying to determine how to support that tribe from that point. The Episcopal Church has been standing with the Standing Rock Sioux Nation’s position on the pipeline since summer 2016. 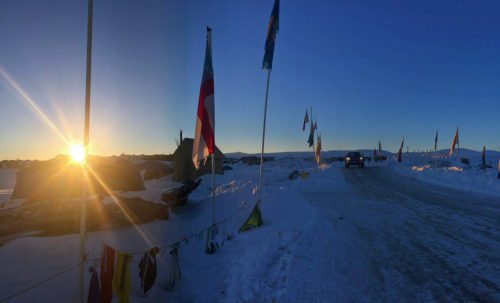 Local Episcopalians have also provided a ministry of presence in and around Cannon Ball, North Dakota, which has been the focal point for the groups of water protectors that gathered near the proposed crossing. Presiding Bishop Michael Curry visited the area in September and many Episcopalians, both lay and ordained, answered Floberg’s call to stand in witness with the water protectors in November. Previous ENS coverage of the Episcopal Church’s work with Standing Rock is here. Floberg said he thinks the pipeline protests galvanized people for other actions. Some marched in the various Women’s Marches on Jan. 21 and he told Episcopal News Service Jan. 30 that he knows some water protectors who were among the people who went to the San Francisco airport Jan. 28 and 29 to protest Trump’s refugee ban. “It awoke our Church to getting engaged and so a lot of our members have,” he said. Thank you for this detailed story. 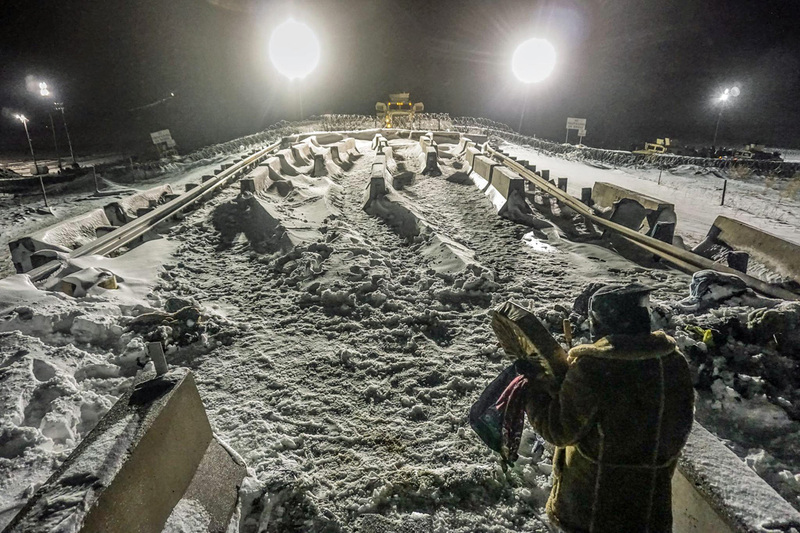 The tribal leaders are correct, in their concern for the safety of the water protectors, and the need to direct the protest along more political and legal channels at this particular time. Blessings to those who stood with the tribes; remember to continue your work in the name of our Holy Creator, Redeemer and Sustainer. This is a wonderful article! I feel so much happier now that I know God our Father is helping this group of folks. No other reports showed the effort of Godly people leading. I wanted to see pray; continued to be amazed at the professional character of the policing folks protecting the pipeline workers. I pray that the water is cared for. I pray for so much for these folks. I loved the comments at the end about folks joining recent actions during the Women’s Marches and the actions at the airport. Standing Rock has indeed become an icon for call to action for the church.